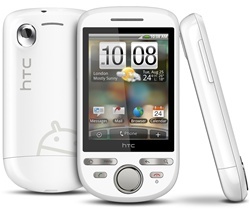 The HTC Tattoo™ is an Android-based phone that brings broad personalization to the masses. With its distinct design and ability to personalize all aspects of the phone, from its hardware to its applications and content, people are able to express themselves and create their own individual mobile experience. The stylish HTC Tattoo is small and compact, fitting snugly into your hand or pocket. It integrates Google’s innovative mobile services including: Google Maps, search, Google Mail, and Android market where users can download thousands of popular applications and games.